AFS Australia asked me to send through a report to let them know how my AFS experience has been up until today. It’s been published on their website, but for posterity’s sake I thought I would cross-post it to my blog too. I had the good fortune to complete an AFS high school exchange in 2000 to Brazil. I often describe this year as a once-in-a-lifetime experience, but that hasn’t stopped me from signing up for another AFS exchange, determined to turn once-in-a-lifetime into twice-in-a-lifetime. Once caught the travel bug is an itchy little critter, so it was with a huge sense of excitement that I said farewell again to family and friends and headed overseas. 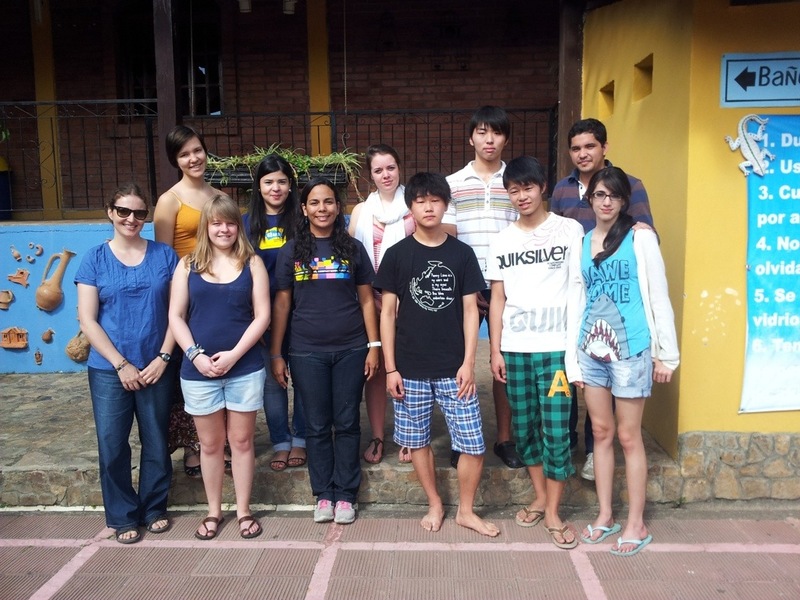 This time I’ve landed in Honduras to complete a semester-long AFS Volunteer Abroad program. I’m thrilled I can combine two passions of mine: travel and volunteer work. The idea of ‘seeing the world with purpose’ is a philosophy that very much appeals to me. An AFS volunteer program was the perfect way to realise this goal. And Honduras certainly hasn’t disappointed. It’s a fascinating country full of contradictions and extremes. I often find myself surprised, elated and dismayed. Sometimes all three in the same day. It’s difficult to single out just one or two highlights of my trip so far. I’ve explored ancient Mayan ruins, written press releases for UNICEF (my community project organisation), toured a volcanic island in a mototaxi (the Honduran version of a tuk tuk), visited families living in extreme poverty, been bogged in an airboat, and spent many, many hours lazing in my favourite hammock. And that’s just the tip if the iceberg. I was also lucky enough to celebrate my birthday here. I had a fantastic party with all my extended host family. As well as tacos, tequila and cake, my fiesta included the violent destruction of a piñata. This was a lot of fun and the remnants made a great party hat! I don’t know if it’s because I’ve lived and travelled in Latin American countries before or because I’m now older (confirmed) and wiser (debatable), but culture shock hasn’t been an issue. I’ve settled into life here with an almost surprising ease. However making friends can prove more challenging than you might expect. It can be difficult to express your personality when you’re working with a more limited vocabulary. I’m lucky that my level of Spanish is pretty fluent, but I still find it hard to joke around and banter like I would in English. One of my host-mother’s friends actually thought I got my words mixed up when I told her I was an extrovert. We now have a running joke that I’m only extroverted in English. In Spanish I’m an introvert. Introvert or extrovert, the way to get the most out of your exchange is to keep putting yourself out there. Always say yes to any opportunities that come your way. You’ll be surprised where saying ‘yes’ can lead you. I’m really glad I decided to turn this particular travel dream of mine into a reality. Halfway through my 132 days in Honduras and there are no regrets, just lots of great experiences and happy memories. If you’re contemplating going on an AFS exchange, I only have three words for you: take the challenge! You won’t regret it. The radio silence about my AFS excursion to Copán doesn’t have anything to do with the quality of the trip, but is more a reflection of my slackness when it comes to uploading photos from my camera. Confusingly the ruins are called Copán and the town is called Copán Ruinas (Copan Ruins). 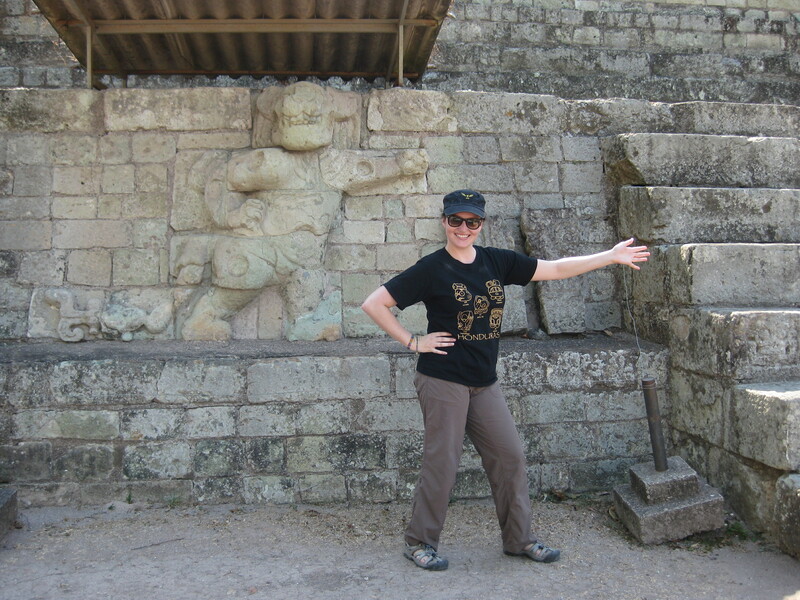 So you travel to the Copan Ruins to see Copán, not to Copán to see the ruins. Still with me? It’s a long drive from Tegucigalpa to Copan Ruinas, which is situated close to the Guatemalan border in western Honduras. Including pit stops and a lunch break it took us just under 8 hours to get there, but it’s definitely worth the journey. Copán Ruinas is a small town with cobblestoned streets and quaint colonial buildings. As well as being the gateway to the ruins, there are also plenty of other tourist attractions to keep you busy. On Friday afternoon we visited ‘Macaw Mountain’. 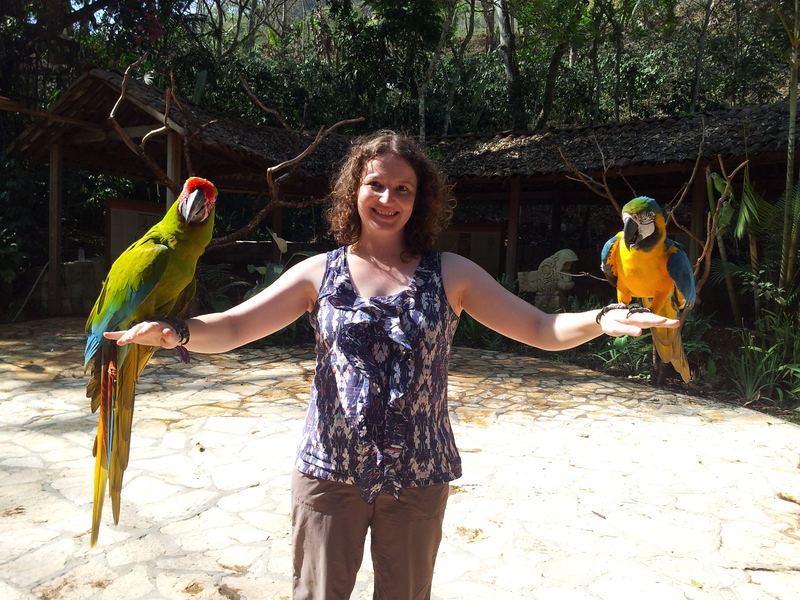 As the name suggests, this is a tropical bird reserve featuring a large variety of parrots, parakeets, toucans, hawks, owls, and of course, macaws. All the birds are either donated rescued. Macaw in Spanish is guacamaya. For some reason my brain insists on memorising the word as guayamaca. Maybe it’s my hamaca obsession filtering through. We toured the ruins on Saturday afternoon. While Copan may not be as large or as big as some of the Aztec ruins I’ve seen in Mexico, the artwork is phenomenal. The detail in the sculptures, or ‘stelae’ as they’re called, is impressive. Our guide was very knowledgeable and once I wrapped my head around her strong accent I really enjoyed her enthusiastic descriptions. Ok, so you kinda had to be there. But you can take my word for it, she was great. The famous King 19 Rabbit. Step pyramid in the main plaza. It was a really interesting afternoon and I wish we’d had more time to take it all in. Whenever I visit ruins I can’t help but remember one of my favourite poems, Ozymandias by Percy Bysshe Shelley. It’s been one month since I stepped off the plane at the infamous Toncontín airport. I can’t believe how quickly the time has passed. I received a lovely ‘letter of support’ from AFS Honduras yesterday, which was filled with words of encouragement and advice about how to work through homesickness and culture shock. This made me realize that I haven’t actually experienced any culture shock yet. In fact, I’ve settled into life here with an almost surprising ease. I don’t know if it’s because I’ve lived and travelled in Latin American countries before or because I’m now older (confirmed) and wiser (debatable), but culture shock hasn’t been an issue. I’m happy to be here and excited to be learning about the Honduran way of life. I think the hardest thing to deal with has been the lack of freedom caused by the insecurity. I’m used to being able to come and go where I please, when I please. Not being able to go for a walk or pop down to the local shops on my own can make things feel a little suffocating, but my host mum has been brilliant at looking for ways for me to get out and about safely. Apart from that minor adjustment, I can’t say there’s been anything that I’ve come across yet that’s really floored me. In fact, until I read the AFS letter I had actually forgotten that culture shock was often part and parcel of the travel experience. Maybe I’m being too blasé and in a couple of weeks’ time I’ll have a delayed culture shock-induced breakdown. But for now, todo bien, todo tranquilo. My AFS guarantee pack, sent to me before I left Australia, contained all the information a prospective exchange student or volunteer abroad participant would need to know about living and working in Honduras. The ‘Community Service Program’ document was 22 pages long and contained general information about Honduras, volunteer work, the country’s culture and customs, living with a host family, AFS rules and costs. Another document, titled ‘Safety Manual’ was 28 pages long. When the document covering safety and security is longer than the document covering the entire program, you can safely assure Toto that you’re not gonna be in Kansas any more. During my AFS orientation weekend we received a presentation on safety and on my first day at UNICEF I received a briefing from UN security. Both talks were actually quite good at striking the balance between reassuring us that it is possible to live here happily and safely and explaining that the risks are real and we need to take them seriously. All the advice resolves around reducing risks. Don’t take public transport. Don’t go out at night. Keep a low profile. Be aware of your surroundings. Try to avoid travelling on your own, particularly if you’re a woman. Don’t carry valuables with you. A family friend’s son was walking their dog a few weeks ago when he was accosted by two youths who jumped off a motorbike and demanded his phone. We’re not sure whether he said something they didn’t like or wasn’t quick enough with handing over the phone, but to show their displeasure they shot the family pet in the head. The poor boy was traumatised, but the reality is, he was lucky. It could have been much worse. 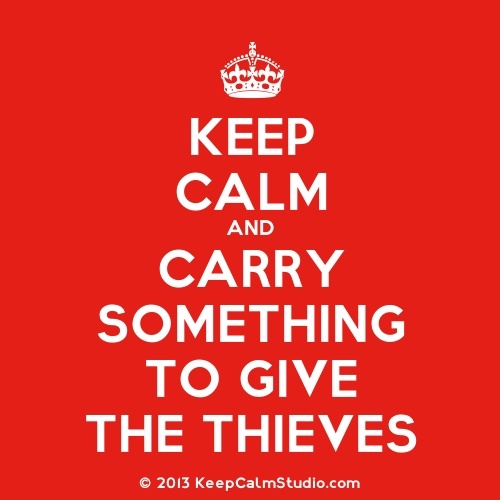 The other bit of advice that’s been repeated to me several times is to always carry something to give the thieves. There have been cases where people have been shot simply for not having enough on them to satisfy their assailant. If I’m out and about I always make sure I’ve got some cash on me, just in case. It seems a little paranoid, but here in Tegus the phrase, “it’s better to be safe than sorry” has taken on a whole new meaning. It certainly makes me appreciate how easy and free things are back home. I arrived in Tegus at 8:30pm on Thursday evening. Waiting for me at the airport were my host mum and a volunteer from AFS. My host mum drove me home and I got to meet my host grandparents and all three of my (initially very wary) host dogs. Several of my host mum’s friends came round to meet me too, as well as my host uncle. It was really nice to have such a warm welcome and meet so many friendly faces on my first night. We had a late, light dinner of dried banana slices topped with a salad of tomato, green capsicum and onion mixed with a vinaigrette. It was really yummy. I should have taken a photo, but after a day of travelling I was really tired and didn’t think of it. When it became obvious that I could barely keep my eyes open any longer everyone said their goodbyes and I went to bed. 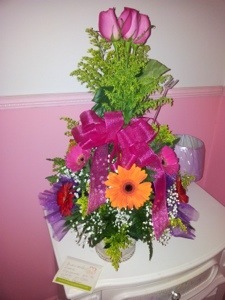 My host family had a gorgeous bunch of flowers and a card waiting for me when I got to the room. My room is lovely and also very pink as it belongs to my host-sister who is 17 and currently on an AFS student exchange to Austria. 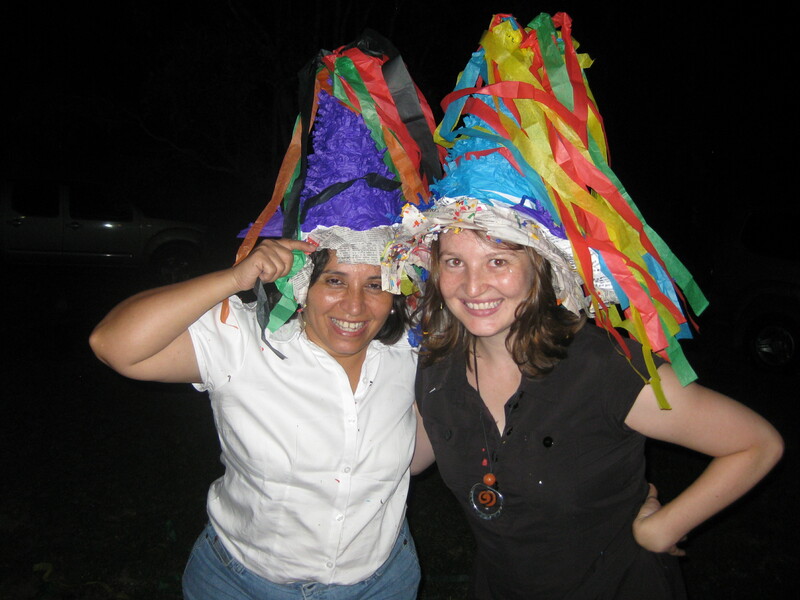 I leave Honduras on 2 July and my host sister returns 5 July so we’ll just miss each other. It’s a bit of a shame, but we’ll chat be able to chat via Skype and ‘meet’ online. The Internet has definitely made the world a smaller place. On Friday my host mum dropped me off at the airport where I waited with several AFS volunteers for the other participants to arrive. There are three boys from Japan and one girl from Sweden starting their high school exchange as well as two girls from Belgium doing the community service program. Once everyone was safely on terra firma we set off for Valle de Angeles, a small town about 40 minutes outside of Tegucigalpa to have our orientation/arrival camp. The camp was fun and, apart from the extra focus on safety and security, very similar in content to the sort of camps we run in Australia. On Sunday we returned to Tegus, quite early in the morning as most of the other participants needed to travel to reach their final destinations. Tela, San Pedro Sula, Danli, La Esperanza and Siguatepeque will each host one of the new arrivals. In Tegus there’ll be me and one of the Japanese students. My host family actually have a holiday house in Valle de Angeles so early on Sunday afternoon I then travelled back there with them. I’ll write a bit more about Valle de Angeles tomorrow if get the time. It’s my first day at work today (Tuesday) so I need to get organised. Fingers crossed I make a good first impression. Wish me luck! It seems like only yesterday I declared my intention of waging a pre-emptive strike against rice and beans however, after 18 weeks of trying to get healthier and happier, I had my final assessment at the gym on Thursday. And there’s good news! All measurements had decreased and both my trainer and I were chuffed with what I’ve managed to achieve over a relatively short space of time. In essence I’ve lost weight where I needed and gained weight where I needed. Less fat, more muscle. Winner, winner, chicken dinner. *Not losing any lower thigh muscle is particularly important with my dodgy knees. My program at the gym is designed to help me strengthen and maintain muscles that support the knee. I went to the physio this week and she was impressed with my ‘quad bulk’. My next challenge is to maintain this level of muscle strength throughout my time in Honduras, so that when I visit Machu Picchu I don’t conk out halfway through. And of course the big questions remain: Have I lost enough weight that it will offset the extra padding I expect to acquire while in Honduras? Will I suffer from Another Fat Student (AFS) syndrome? Can I continue my healthy eating habits while travelling? I’ve been barely able to contain my excitement since receiving my full AFS Community Project Organisation (CPO) details the other week. I’ve known for a little while now that I’ll be volunteering with UNICEF Honduras, I just wasn’t sure in what capacity. I now know that I will be working with their communication team to support their advocacy and social communication program. The main objectives of this program are to promote children’s rights and to develop communication strategies. The role will involve office work as well as occasional fieldwork on weekends, where I imagine I’ll be able to see UNICEF’s projects in action. This will be a great way for me to learn about the challenges the country faces and also see a side of Honduras I probably wouldn’t get to explore as a tourist. The type of work I will be expected to assist with could include tasks such as conducting training, developing communication materials, and supporting virtual networks. I found my supervisor’s UNICEF profile online and I’m really happy that I’ll have the opportunity to work with someone so experienced. I definitely think I’m going to learn a lot. I’ve deliberately tried to keep my existing work world and the blogosphere separate, however it’s worth noting here that I currently work as a communication and media officer. So to say that the CPO I’ve been assigned to suits me to a T, would be a slight understatement. Hello dream job! I’m excited about the placement but also a little nervous. I think I’ve got the skills and qualifications to be an enthusiastic and productive volunteer; I just hope I can live up to any expectations the team might have. Wish me luck! I have a Honduran family! I received my host family information on Thursday. It was so exciting to read through the pack and look at all the photos. I will have a host mum, 17-year-old host sister, host grandpa, host grandma and three host dogs at home. My host sister is currently on exchange. I’m not sure if we’ll get to meet during my stay or if she’ll be overseas the whole time I’m living with her family. As I’d guessed, I will be living in the capital, Tegucigalpa, but on the outskirts or outer suburbs of the city. My host mum describes the area they live in as a quiet and peaceful place surrounded by trees and mountains. I won’t go into more detail here until I’m able to check that my host family is comfortable with the idea of ‘starring’ in my blog. They all look lovely though and I can’t wait to meet them. I’m so grateful they’ve decided to open up their home to me. I hope they’ll get as much out of the experience as I’m sure I will. Hosting an exchange student (or in my case an adult volunteer) can be a wonderful way of learning about another culture. You don’t even need to leave your living room. I can’t recommend the experience more highly. Whether you’re a participant or a host family there’s so much you can learn and so much fun to be had. If you’re interested in hosting an exchange student check out the AFS website for all the details. Many year and semester programs start in February, so I’m sure there are plenty of students out there who are anxiously awaiting news of their host family like I was. Could the information pack they’re waiting for be about your family? For those wondering about what sort of work I’ll be doing in Honduras, where I’ll be living and what my host family will be like… Join the club! I’m president, treasurer and secretary. I’m still waiting for these details to come through from AFS. In an ideal world I’d find out before I leave Australia on 13 February. The program in Honduras doesn’t start until 22 February though, so there’s actually a fair chance I may already be on the road in Mexico when the details come through. Which will make for a rather interesting arrival: Hello Honduras! I don’t know where I’m living or what I’m doing, but I’m happy to be here. I did find out quite a while ago which organisation I’ve been assigned to volunteer with, but I wanted to wait until I had more details before blogging about it. Seeing as I may not have these details any time soon I figure now’s as good a time as any to announce that I’ll be working with UNICEF Honduras. I couldn’t be more thrilled with my placement. Ever since I found out I have been stalking their Facebook page and website relentlessly to try and get an idea of how they operate and what I might be working on. UNICEF’s mission is to build a world where the rights of every child are realised, so I’ll be happy to help them out in any capacity I can. b) it’s got a pretty ‘interesting’ reputation in terms of crime. However I’m determined to approach everything next year with a positive attitude and a ‘let’s make lemonade’ approach. According to Wikipedia Tegucigalpa (Tegus for short) has a population of about 1.2 million people. This makes it larger than Canberra and Blumenau (where I lived in Brazil) but smaller than Sydney or Puebla (where I lived in Mexico). So on reflection, this could be a good size for me. Not too big, not to small. A Goldilocks city size. The other great news is that because of Tegus’ high altitude it’s still considered as having a tropical climate but it’s less humid than the lower valleys and coastal regions of Honduras. Considering my aversion to hot weather this could work out very nicely for me indeed. The only way to lose weight is to check it as airline baggage. A combination of factors has led to many items in my wardrobe starting to feel a wee bit too tight. I like to call it the knee-injury-plus-break-up effect. Ordinarily, a few extra kilos (or in my case, eight extra kilos) would not be too much cause for concern. Eating healthier food in smaller portions combined with daily exercise should help me gradually get back to my normal weight. However the complicating factor I’m now facing is that there are only a few months until I depart for an extended overseas trip. And, as many of you would know, weight loss is to travel, as a snowball’s chance is to hell! Over at The Healthy Globetrotter Leah has some great tips on how to stay fit and healthy while travelling. I had to laugh when I read her description of travel sometimes resulting in coming home with “a little extra padding”. As an exchange student, we used to joke that AFS stood for Another Fat Student. Weight gain while living overseas was almost unavoidable for most of us youngsters. On the plane home from Brazil we all compared our mass increase like it was a badge of honour. From what I can gather, the staples of the Honduran diet are beans, tortillas and rice. I already know from past experience that Em + a high-carb diet = extra kilos. So the challenge is set! Can I lose enough weight before I head to Honduras that it will offset the extra padding I expect to acquire while over there? I would love to break-even, if a net loss isn’t possible. And before I start getting lectures, yes, I do know that weighing yourself is not an ideal way to track overall health, and yes, I do know that muscle weighs more than fat. But in terms of a benchmark I’m happy to use kilograms for now. I’ll post regular updates on my progress, assuming there’s anything to report. In this case, no news is bad news!